This miniature cornucopia basket is woven in dollhouse scale using fine paper covered wire and thread. You can adapt the materials to suit the size of basket you wish to make. I wove the 1:12 scale basket shown here using two strands of embroidery floss, along with # 30 gauge paper covered wire. Beginning weavers may find it easier to use firmer thread, such as quilting thread or crochet cotton. A single strand of embroidery floss along with # 30 gauge wire or finer will make a 1:24 scale basket. To prepare the materials for weaving the cornucopia in miniature, cut lengths of your weaving material roughly 20 inches (50 cm) in length. You will also need four lengths of wire, at least four times the length you want your finished basket to be. I used four, 6 inch (15 cm) lengths of wire. Paper covered wire is easiest to use, but regular craft wire will work as well. The wire must be fine enough to bend easily in order to shape the cornucopia. To blend the wire 'stakes' in with the embroidery floss 'weavers' I painted my paper covered wire a similar shade to my embroidery floss. You will also need a small amount of cyanoacrylate (super) glue or other fast setting glue. You can make the cornucopia without the super glue, but it does make it easier to hold the stakes as you increase the basket size. To begin weaving your cornucopia take two of your lengths of wire and lay them side by side on a flat surface. Take your other two wires and set them at right angles over the first set of wires (see photo). The wires should cross each other at the center. If you have some, apply a tiny bit of superglue (cyanoacrylate) to the join of the wires to hold them tightly to each other. Do not apply too much glue! Hold the wires together by using a pairing weave . Fold your weaving thread length in half, and loop the middle over one of the doubled sets of wire on the base of your cornucopia. Take one end of the thread and pass it under the next doubled set of wires, while the other end of the thread goes over the wires. Continue to 'pair' over the wire 'stakes' with your weaving thread until you have gone completely around all the wires, this should hold the wires together for the next step. The next stage in weaving the miniature cornucopia basket is to pull all the wire stakes to one side at right angles to the wire cross you secured in the previous step. You can use a pair of bent nose tweezers to carefully turn the wires as shown in the photo. Make sure you keep your wires straight and keep the wires doubled together as you work a few more rows of pairing around the doubled wires to set the end of the cornucopia horn. Once you have woven roughly 1/4 inch (5mm)of your cornucopia base, spread the doubled wires apart and begin to pair your weave over individual wires. Try to keep your wires straight and use a pin or needle to press the weaving down so it fits tightly over your wires. As you weave, gently spread the wires to begin to form a narrow cone for the base of your cornucopia. To gradually increase the width of your cornucopia horn, it is helpful to have a narrow cone as a base shape. I used the end of a ball point pen, but a cake icing tip or other narrow cone shape will work as well. the shape into the end of your cornucopia and space your wire stakes evenly around the cone shape. Then weave the basket base, using the cone to increase the basket width gradually. At this point in the weaving I bend the narrow end of the cornucopia and continue to weave tightly keeping the weave evenly around the stakes. At some point as you weave your cornucopia, the space between the wire stakes will be double the thickness of the stakes themselves. At this point, you need to add in extra weaving stakes so you can increase the spread of the horn of your basket. To add in extra stakes, cut 8 short lengths of your wire (I cut 3 inch ( 7.5cm) lengths). Apply a tiny bit of cyanoacrylate glue to the base of one of the extra stakes, and lay it tightly alongside an existing stake, with the glued edge of the wire just setting against the woven thread alongside the stake. Allow the glue to dry and add in the next stake, continuing to pairing weave around the doubled stakes as you add them in. You can add in the stakes without gluing them to each other initially, but it does take greater dexterity and patience. Try it on your second attempt at weaving a cornucopia when you are more familiar with the process! Once you have all the stakes doubled for your cornucopia, continue to work pairing weave tightly over the doubled stakes in order to set the stakes firmly into the sides of the cornucopia. I work from 6 to 8 rows of pairing around the doubled stakes to make sure they won't come loose when I go to separate them. Once your extra stakes are firmly set into the sides of the cornucopia, spread the stakes out evenly and begin to weave pairing around the individual stakes (wires). At this point I inserted a wider pen barrel to help shape the horn of my miniature cornucopia. You could also make a shape by twisting paper or foil to make an appropriate sized cone base for your woven horn. Now that all the stakes are set in place and you are weaving over single wire stakes, you can change to a different style of weaving if you wish to make a pattern. You could switch to a 'randing' weave, as used on the miniature change table and weave two strands in and out between the wires, rather than capturing each wire in the center of a pairing weave. Different weaving patterns will give your cornucopia a different finish. For the cornucopia shown in these instructions I wove only using pairing. As you weave your cornucopia continue to shape the wire stakes so the cornucopia has the curve you want for your horn. 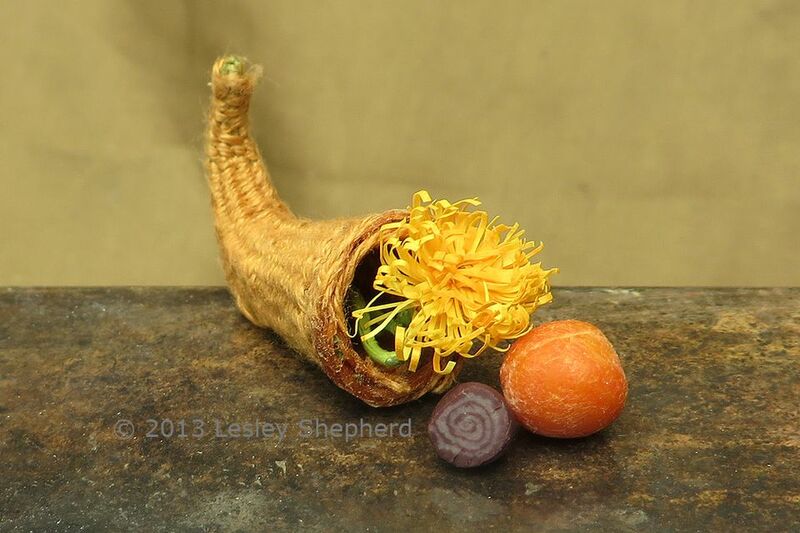 When you have your cornucopia almost as long and wide as you would like it, you will need to finish the shape of the horn so it will sit easily on a display. To make the cornucopia wider at the base of the horn for your display, you will need to extend the bottom edge of the horn. To make the base wider than the top of the horn, weave with pairing to the center of the side of your horn, then turn and weave in the opposite direction to the center of the opposite side. Turn the weave again and weave back, this time turning one wire stake before your first turn. Weave back and forth over the bottom half of your cornucopia for four to six rows. You can see the turns in the weave on the cornucopia in the photo on this page. This extra weaving on the base of the horn will help the horn extend out on the bottom edge. To finish the weaving on your cornucopia work three to five rows of pairing around the entire bottom edge of the horn after you have finished shaping the extended bottom edge. The even pairing around the end of the horn will cover the areas where you added extra rows to the base and will blend the extra rows into the final shape of the horn. To finish the edge of the cornucopia it is easiest to glue a row of braided thread of embroidery floss over the trimmed wire stakes. Take some of your weaving thread and braid a simple three strand braid for the edge of your cornucopia. Use a pin to hold the knotted threads in place and provide tension while you braid. You will need a finished braid at least twice as long as the circumference of your cornucopia. When your cornucopia is the size you would like and you have paired the ends of the horn so there is an even edge, you can cut and finish off your wire stakes and add the braided edging. Use wire cutters, kitchen shears or end cutters to cut your wire stakes flush with the weaving threads. Apply a tiny amount of cyanoacrylate glue, or some other thick craft glue like Crafter's Pick Ultimate Glue to the end of each wire stake, gluing the weaving threads neatly to the stake. When you have all the stakes trimmed, set the cornucopia aside to dry. To finish the open end of the cornucopia, apply a bit of glue to the outside edge and glue your braid so it covers the wire stakes and holds the woven edges in place. If necessary, you can glue a second section of braid to the inside edge of the cornucopia. Depending on your thread, you may be able to roll the braid over the edge of the cornucopia to finish both the inside and outside edges. You can see how a braided edge is applied in the instructions for the miniature flower gathering basket. Experiment with different threads and weaving patterns to make your own unique style of cornucopias. Larger baskets in this style can be woven for large flower arrangements. Upended cornucopias are similar in shape to the large floral baskets used for weddings and funerals.